It was later discovered that in late December 1913, a Franciscan friar named Francis Donnelly (1863-1929) gave the sisters a retreat. During the retreat he emphasised the power of the Holy Name of Jesus and also the devotion and zeal of St. Bernardine of Siena- a fifteenth century Franciscan who popularised and preached about the Holy Name of Jesus. 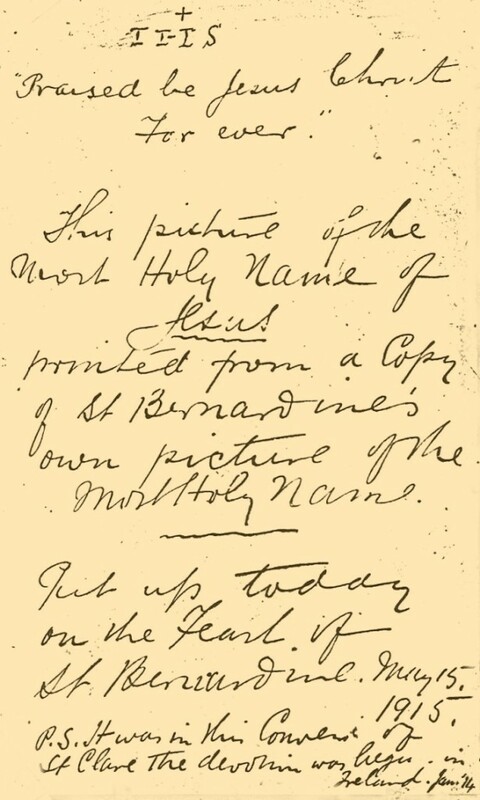 His preaching made a deep impression on the sisters, so much so that they erected a picture of the Holy Name in the Chapel on the feast of the Holy Name the following January 3rd.